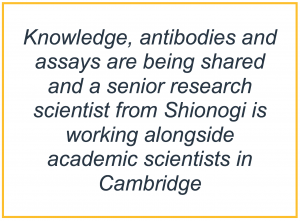 Since joining the Milner Therapeutics Consortium in 2016, Shionogi have developed a strong relationship with the Cambridge academic community working in infectious diseases, a significant area of focus for the company. 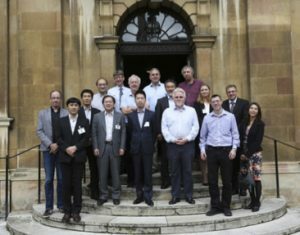 Shionogi have been involved in a number of joint funding bids to the UK research councils and have provided resources to support projects themselves. For example, a project with Dr Martin Welch from the Department of Biochemistry is focussing on improving the therapeutic potential of antibody-mediated inhibition of Pseudomonas aeruginosa. Pseudomonas aeruginosa is a pathogen which is found in many patients in hospital intensive care units who either die of- or with- infections caused by this organism. It is also frequently associated with chronic airway infections in cystic fibrosis patients. The mechanism of infection is through the Type III Secretion (T3S) system which is therefore a target for intervention to suppress virulence of the P. aeruginosa pathogen. The protein PcrV has been shown to be critical to virulence via the T3S system and antibodies against PcrV improve survival in mouse respiratory infections. Humanised monoclonal antibodies against PcrV to treat humans exist but there are still many challenges to them reaching their full potential. There are usually a number of microbial species present in an infection in addition to P. aeruginosa and it is also possible that inhibition of the T3S system may inadvertently increase antimicrobial resistance. The aims of this project are to better understand i) the molecular mechanisms underpinning anti-PcrV antibody action, ii) how to quantify antibody action and iii) the wider consequences of inhibiting PcrV function on other cell processes. Knowledge, antibodies and assays are being shared between the two partners and a senior research scientist from Shionogi is working alongside academic scientists in the Welch lab to enable efficient transfer of knowledge and technical skills back in-house to Shionogi in Japan.